Yo Feist is doing a song with Sloan at our show tonight. Might want to bust over there - their set starts in 2 minutes. Toronto! So many great bands. Anyways, as you can see the embed code doesn't work. Feel free to just click THIS link and do it yourself thanks. Hi, it's 9am in Auckland, we're up early watching Chelsea V Manchester City. Ben is talking to himself and yelling at the TV even tho City is winning. Maybe he's still asleep? Tonight we're playing our last show with Foo Fighters, at Western Springs Stadium. For us the tour felt like one giant spa-vacation with a bit of music involved. I watched the entire Foo Fighters set in Sydney and it was honestly jaw-dropping. After, we are having a big party, then spending the next 34 hours getting home. If you are in Vancouver and want to bring us presents at 7am, we have a really long stop-over. We are also on the cover of Spin this month. I had a subscription to Spin when I was 13 and basically read it cover to cover every month. Also they gave us record of the year for "Octavio made the Bomb". Just kidding, for DCTL. TONIGHT we're also gonna be on an episode of No Reservations with Anthony Bourdain doing our rendition of "Jingle Bells". Should be fun. Depending on what time zone you are in, this may already have happened. IT HAPPENED: Here is the video. 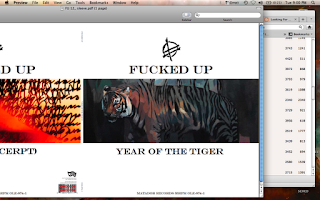 Also don't forget you can order YEAR OF THE TIGER here and here. It makes an excellent stocking stuffer (when it comes out on Feb 26). 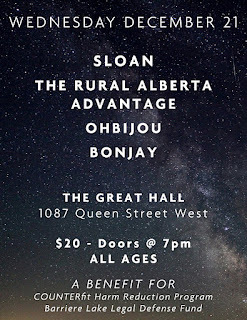 Lastly, there are still some tickets left to our benefit jams in Toronto next week. Please read about the charities and buy tickets here! Oh also we're playing in Brooklyn with Dom and Radical Dads, basically as soon as we get off the plane from Australia. Get ticekts to see our jet-lagged selves HERE. Wow what a lot of hyperlinks. If you need a recap please click HERE. Hey here are some random things, well just one actually. 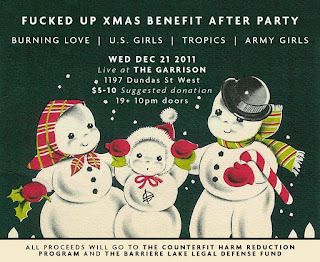 On Dec 21st, the 2nd night of our xmas benefit shows, Sloan is going to be playing the full One Chord to Another. The thing about Sloan is that EVERYONE LOVES SLOAN and this will be amazing. 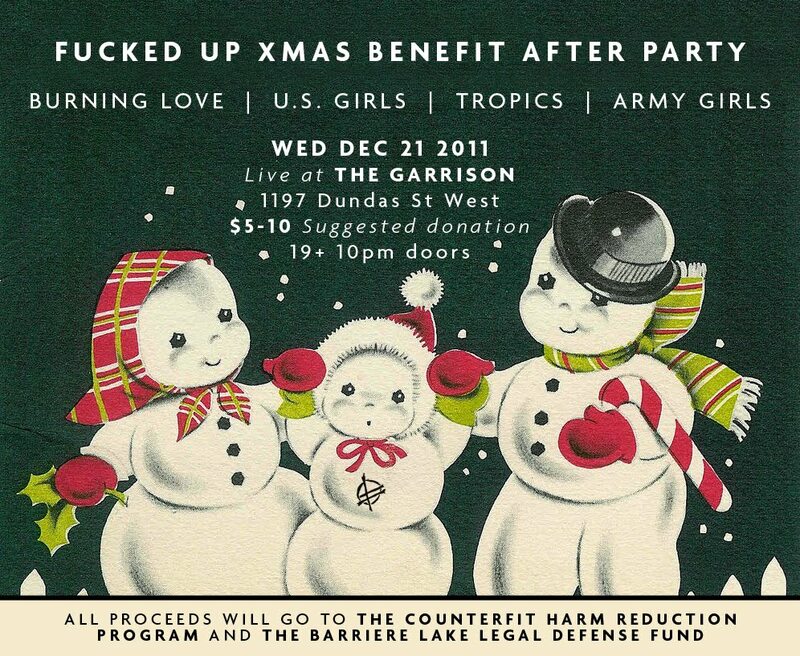 ALSO CHECK THE AFTER PARTY FLIER ABOVE. 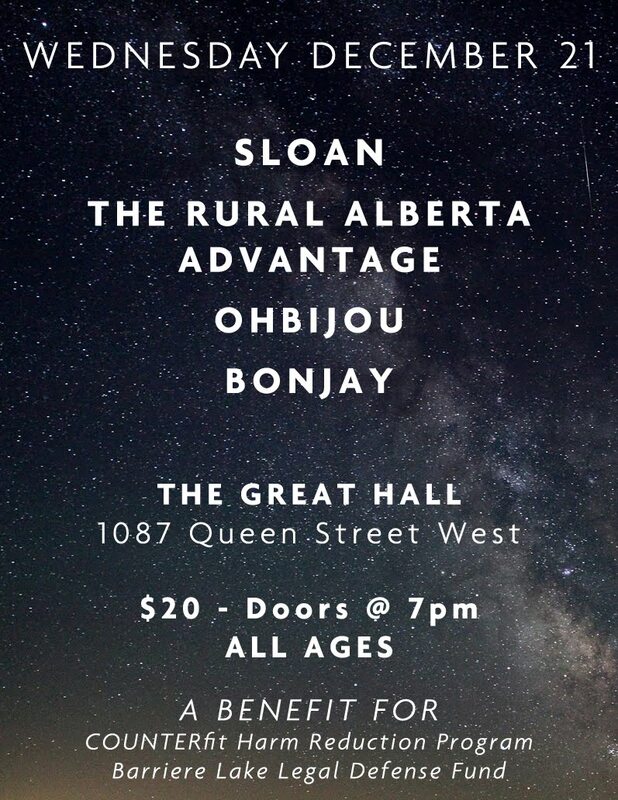 There are no advance tickets for the after party so just chill and come on by. ALSO we're gonna be selling a split 7" we did with Sloan at this show as well. You can hear their side if you look for it on the internet. Our side is a cover of JINGLE BELLS. 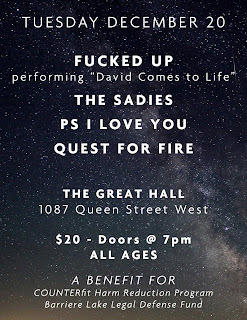 You can still get tickets for this thing at Soundscapes and Rotate and maybe some other places, and also at our webstore right HERE. 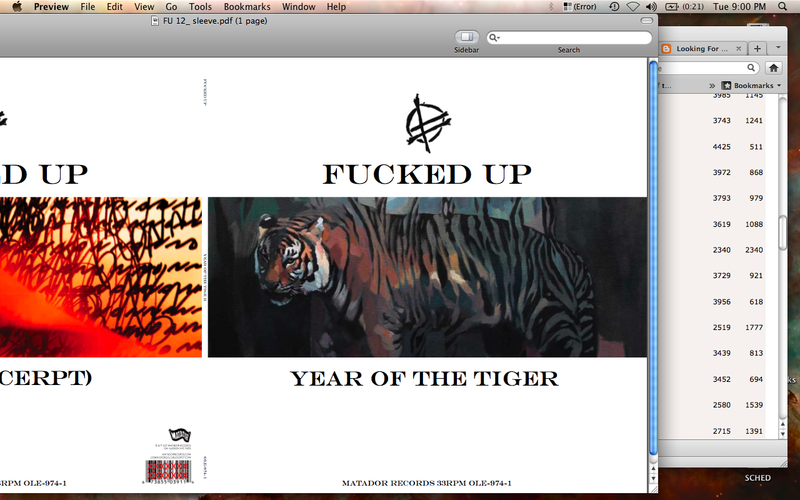 Plus don't forget YEAR OF THE TIGER is up for pre-order HERE. Hey this is finally done and ready for sale. Sorry it took so long - we actually finished recording most of this thing before we even started writing DCTL. We thought that Chinese custom meant that Tiger was two years, like having to repeat grade 6...we were wrong. Anyways, it's honestly one of the best things we've ever done, both sides. Pre-order it HERE. Hey today we're doing our last of 3 shows in Melbourne, what a great place to spend 5 days. When we get back home there are a few things going on that you might want to be involved in. First thing, we're gonna be back in NY in a few weeks to play the Brooklyn Bazaar. Not really sure what that is but I'm sure there will be lots of muffins and xmas knick knacks you can grab. 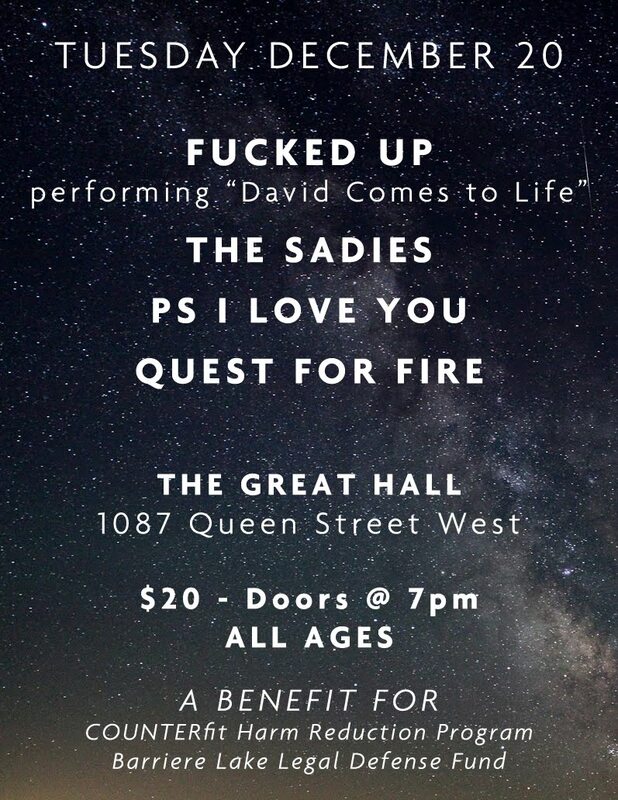 Plus it's all ages and only $10. and tickets for the Sloan show are HERE. Also, for those of you in Toronto with cable, we're on the George Strombolopolous show "tonight", whatever that means, cause we're on like a 16 hour time difference. Also we have a new video for "Turn the Season" premiering on the 14th of Dec, so set your internet clocks for that. Just wanted to drop a note to congratulate Jonah (from Fucked Up) for his grammy noms today - not many ppl know this but Jonah grew up playing in Jazz ensembles around Toronto, which is why he now shreds on the drums. He has been doing some side stuff lately and picked up a couple of nominations with some records he played on, namely BEST IMPROVISED JAZZ SOLO for "Sonnymoon for Two" with the Sonny Rollins Band, and also for BEST LARGE JAZZ ENSEMBLE ALBUM for his work with the Arturo O'Farrill & The Afro Latin Jazz Orchestra. NICE ONE JONAH (this is true - look it up).